Helicopter! Sometimes it's the first thing my 20-month old says when he wakes up. His favorite toys are plastic vegetables and he doesn't even have a single helicopter toy, but it's like a little boy switch turned on a couple months ago and Greyson suddenly can't get enough of vehicles. He's also a big fan of airplanes, ambulances, trucks, bulldozers, buses, trains and police cars. But helicopters are numero uno in his book. Since we live for smiles from our toddler, my husband and I decided to take a field trip to helicopterlandia, the U.S.S. Intrepid Sea, Air and Space Museum, which is on a decommissioned aircraft carrier that's been parked in the Hudson River as a museum ship since 1982. Greyson gets us excited about doing a lot of things I never cared about doing before. But I wasn't excited about the price of admission. $24 per adult? Seriously, almost $50 to go see some old helicopters on a boat? I'd rather get an awesome lunch. We went anyway (and found discounted tickets with a quick Google search) and it was worth the trip. Definitely go to the Intrepid if your kid is into helicopters and stuff. They will enjoy different things about it at different ages. For our 20-month son, he was into seeing all the vehicles up close and even getting into some of them. It's cool to show him that the things he sees from afar, like helicopters in the sky, are real things with real details. We didn't have time to slowly meander and read any cool history stuff or the serious museum parts since we were chasing Greyson around. But, that was fine. Here are some tips if you go! -Find a discount online. A quick Google search got us a discount of almost $10 off the price of admission. It said you were supposed to print something out, but showing them the coupon on our phone was enough. -Kids under 3 are free. 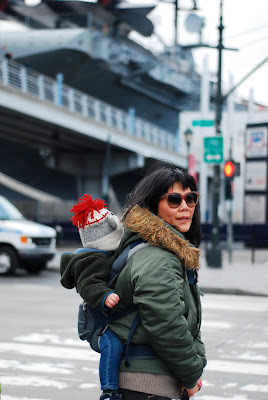 -A carrier rather than a stroller might be easier if you have a choice. You can get to most parts of the Intrepid with a stroller, but it seems like there can be long waits for elevators, etc. -Don't go when it's raining. They close off the flight deck when it rains and that's sort of the main attraction, or it was for us. -There's a submarine that you can go into, but kids have to be atleast 40" high to go in since they have to crawl around on their own for parts. 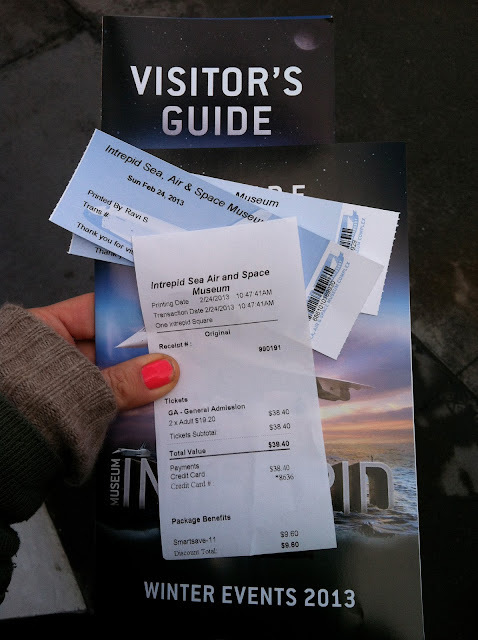 -If you go to the Intrepid with a toddler, you may end up spending an hour and a half there. -Daisy May's BBQ is around the corner from the Intrepid if you want a spot for lunch. We went to El Rancho, a Mexican takeout place (that used to be called Paloma) on 45th Street and 9th Avenue. It's basic and good if you're in the neighborhood and craving a carne asada burrito with a lot of Yucateco hot sauce.